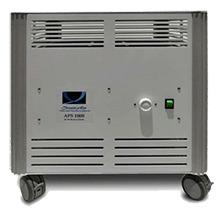 SecureAire’s APS-1000X is a Portable Air Purification System that utilizes Advanced Collector System (ACS) Technology. The ACS is the most advanced and optimized Electronically Enhanced Air Purification system available in today’s marketplace. Inside the APS-1000X, you will find a fan, the ACS System, a replaceable SecureAire filter and a variable-speed controller. This is a complete system that can deliver up to 1000 CFM of particle-free air. The system is portable and can be placed in a room or construction area thereby treating any specific and desired space. The APS-1000X is designed to maximize particle control by optimizing the three components that dictate air purification. Portable System allows placement into any targeted space. System provides up to 800 CFM of continuous air purification. Indoor Air Quality can be dramatically improved when remodeling or light construction is being done.